Revealing that Lee Westwood came to him earlier in the week with a request to go out first for Europe and relieve the pressure on McIlroy and Graeme McDowell, Monty said: “I wasn’t trying to hide Rory from Tiger. Not at all. But I think it is good actually that Rory can get a game under his belt without Tiger Woods, to be honest. 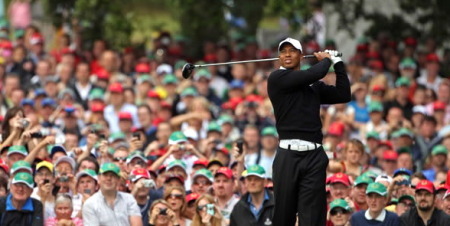 “I am glad that Rory and Tiger are not playing each other the first morning. It gives Rory, especially, a chance to see what this Ryder Cup is all about. McIlroy and McDowell will go out in the second match of the day against Matt Kuchar and Stewart Cink with Woods and Steve Stricker down at No 3 in the order against Ian Poulter and Ross Fisher. Asked if Corey Pavin had put Woods out late in the order thinking that Montgomerie would hide McIlroy there, Montgomerie pleaded ignorance. He said: “I don’t know what Corey was thinking. That’s all hypothetical. I don’t know why he put Tiger out third. “All I can say is that every point is important whether you are first off, third off or the seventh match or the 20th match. Let’s just hope it doesn’t come down to the 28th. Rory McIlroy would love a singles showdown with Tiger Woods in October’s Ryder Cup.